In Quoc Phuong's article published on BBC dated April 9, 2014 with its title “Human Right Watch: “Cu Huy Ha Vu, Ph.D. must exile”, it quotes Brad Adams (Director in Charge of Asia Affairs of Human Rights Watch)'s comments, about the man Cu Huy Ha Vu in Vietnam. If these comments had been created and broadcast by an average, unpopular person than the authors of this book would not have been interested to analyze his opinion. However, Brad Adams, has broadcast his views as the Director in charge of Asian Affairs of the Human Rights Watch (HRW) then the authors would like to raise up our questions. Even HRW is only a non-governmental organization (NGO), but its programs always carry some significant weights, especially to Vietnamese audience who do not access different news sources. Or these Vietnamese have been under the influence of dishonest political propaganda and unethical, money-run writers who only worship foreigners and foreign civilization. “(Cu Huy Ha Vu), a prominent political activist in Vietnam who has always called on political modernization in Vietnam but now he is forced to exile from his fatherland” (sic). Let’s ask “advertiser/ salesman” Brad Adams to show proofs and evidences that Cu Huy Ha Vu is a “prominent political activist” in Vietnam? Who endorses him? In Vietnam there are three groups:” Communists, fake politically opposing groups and the majority of repressed people such as workers, peasants, small business owners, overseas laborers, veteran handicapped, and the Republic of Vietnam’s veterans, officials and civilians…”. The oppressed people in North Vietnam who were victims of Ho Chi Minh’s land reform campaign (1956), of cultural and thoughts revolution, of private business reeducation/ renovation, those people who got discriminated by their faith, those families who were classified as inappropriate to the socialism. Then which groups are his supporting main groups? Which poll agency did Brad Adam extract data for his statement? Please present evidences. a) Brad Adams is also requested to specify Cu’s specific achievements which provides result such as “Vietnam is currently in need of people like Cu Huy Ha Vu who works hard to create a society which is based on respecting human rights. Now, he has to exile from his country. This treatment is unfair to him and to his family and to Vietnamese, because he has done nothing wrong” (Sic). When giving his best rating to Cu as such has Brad Adams understood how a man like Cu can “create a society which is based on lawful principles of respecting people’s rights (sic)? Whatever Cu had done until he arrived in the U.S. to have his heart treatment was exact similar as Hoang Minh Chinh came to the America to cure his pancreatic cancer. But in fact, both of their trips were politically motivated. 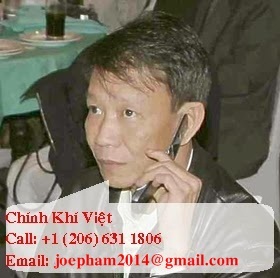 There was no single act that Cu Huy Ha Vu has ever acted to campaign for human rights in Vietnam. E.g. : Cu petitioned for the position of Ministry of Cultural Affairs. He suggested to change the country name into Vietnam only and cut off the tail “Republic Socialist”. He suggested amnesty program to the former officers and officials of the Republic of Vietnam. He “sued” (fake or real?) Nguyen Tan Dung on China’s bauxite exploitation in Vietnam when there were many other many more strategically and systematically important issues everywhere in Vietnam. Cu has continued extensively to praise Ho Chi Minh (a greatest national traitor) and Ho’s subordinates. Cu Huy Ha Vu also utilizes his artistic talent to draw all members of the Vietnamese Communist Politics Bureau. Has Cu ever drawn any fine arts such as artists Nam Son, Bui Xuan Phai, Hoang Lap Ngon, Tran Dong Luong, Nguyen Sang…Cu Huy Ha Vu has only cared to meets and broadly smiles to top political leaders such as Do Muoi, Le Kha Phieu, Nong Duc Manh, Le Duc Anh and Vo Nguyen Giap…”. His admirers are all politically criminals who have cruelly persecuted and completely stripped of basic human and civil rights of all Vietnamese poor and unfortunate citizens. 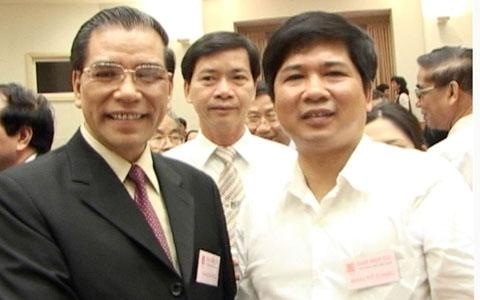 These leaders have master minded and carried out many horrified political campaigns and cruel attacks of the Communist Party of Vietnam (CPV) since its founding day of 1930 until now. In the CPV’s brutal “dig deep and pull out all roots” to Vietnamese suffered citizens but the two poets Cu Huy Can and Xuan Dieu (Father and adopted father of Cu Huy Ha Vu) had strongly reinforced that above massive killing strategy using their bloody poetic verses. But today, Cu Huy Ha Vu has been still always and strongly proud of the soakingly bloody “poetic master pieces” of his father and adopted father. Let’s remind the incident when Cu Huy Can came to Hue to receive the imperially entrusted sword by King Bao Dai then his group member, a married man Tran Huy Lieu, fell in love with the wife of Pham Giao, who was the son of scholar Pham Quynh. Then Tran Huy Lieu quickly took that opportunity to kill both father and son of Pham Quynh, Pham Gia to steal Pham Giao’s wife and brought her to Hanoi to become his second wife. But Cu Hy Ha Vu has never voiced out his protest to Lieu. However, Cu assisted with Lieu to “dye into red” all Northern intellectuals and writers in order to transform the intellectuals, artists…of South Vietnam the “state-hired” employees. Cu Huy Ha Vu must know his father Cu Huy Can was a major criminal accomplice of Ho Chi Minh group who had tread under their feet the basic human rights of millions of hard working, innocent Vietnamese from the so-called “The Fall Revolution 1945” until all those innocent people horrifically persecuted and died. Vu is still proud of his biological and adopted father’s notorious achievements then how can he fight for human rights for millions of Vietnamese citizens? His biological father of Vu was Cu Huy Ca. His adopted father was former General Vo Nguyen Giap. In dynastic regimes, the Kings of Le cleared the charge against the trial:” Le Chi Vien”. It means the current King should never make mistakes which were committed by their father Kings, even small ones. Were these precedents in ancient history of Vietnam good examples to Vu. Or because he attended Sorbonne Law School so he does not understand well the fine and ethical history of Vietnam. Another incident: Cu arbitrarily and fully seized his father Cu Huy Can's heritage by coercing his half-sister (same father, different mother) out of her legal inheritance. To his own blood sister, Cu Huy Ha Vu was so cruel as such then is there any chance that Vietnamese citizens would be treated as dignified people with real liberty or these citizens are only his political and economic slaves in a real sense. Graduated from Sorbonne university and Cu Huy Ha Vu demanded to be appointed as Ministry of Cultural Affairs of Vietnam. It is easy to understand he thinks he belongs to the same group of the Communist Party of Vietnam (CPV) like the children of former General Secretary Nong Duc Manh, Nguyen Van An, Vo Van Kiet, Nguyen Tan Dung, Nguyen Van Chi, Nguyen Ba Thanh, Le Duc Anh, Le Thanh Hai...Do Vietnamese people need him? Or in fact, no single Vietnamese people ever need him. Furthermore, Brad Adams also “threw out forcefully his media…grenade”: Cu Huy Ha Vu has a broad support by his people. I think if Vietnam is a free country, one can imagine he may quickly become a good political leader or a successful political candidate instead of being treated as a violator of laws only because he has his different political viewpoints to the government. Therefore, that was a worst day to Vietnam when a such talented person like him was forced to exile (sic). Brad Adams has strongly identified himself that he is unable to recognize that the political viewpoint of Cu Huy Ha Vu and that of the Communist Party of Vietnam (CPV) are exactly identical ones. Because both Vu and the CPV both have commended the strategies that Ho Chi Minh had pioneered, guided and instructed the CPV to follow until today. If Vu had suggested the CPV should establish diplomatic relations with the U.S. then that is only the repeat of Ho's tactics in which Ho copied the U.S. Declaration of Independence and pasted into Ho's declaration of independence. But their ultimate goal is to enforce the existence of the CPV in which Cu Huy Ha Vu and his dead father, poet Cu Huy Can are the full beneficiaries. If Cu Huy Ha Vu was forced to leave Vietnam then in Quoc Phuong's article in which lawyer Nguyen Van Dai's statement was quoted:” Months ago, lawyer Dai and a number of his friends were informed by lawyer Nguyen Thi Duong Ha, wife of Cu Huy Ha Vu. PhD., that Cu will be likely to go to the U.S. soon (sic). At that same time, Cu's wife arrived the U.S. and was (tours) guided by the whistle blower while in jail Nguyen Tuong Tam to go to many places in the U.S. The incident was a good early arrangement to find a place to prepare for Cu to come to the U.S. later soon. It was a good plan, no sudden exile as they claimed. The fishy play in which Cu Huy Ha Vu was escorted from his jail cell to the airport was only a smelly bad advertisement which was resembling to Brad Adams's bragging show for Cu Huy Ha Vu. Brad Adams has his right to make his own political statement. But when he made his exaggerating untruthfully political assessment, as the director Human Rights Watch (HRW) in charge of Asian Affairs, about Cu Huy Ha Vu, then his assessment is conflicting with his duty and his position which should have been unbiased. His voice has been indeed seriously under Vietnamese people's strict scrutiny. Brad Adams cannot play as an official of HRW to make shallow political opinions about Vietnam. His worst statement about Cu Huy Ha Vu's trip to the U.S. was “a worst day for Vietnam” (sic). If Brad Adams had been a Vietnamese by birth who lived in North Vietnam before the Fall of Saigon (April 30, 1975) then Adams would have been able to perform better than great poet To Huu in his state-run propaganda and definitely go against his noble mission of “human rights watching”. It means Brad Adams may have better politically maneuvering skill than Cu Huy Ha Vu's father Cu Huy Can and also much better than Vu's adopted father Xuan Dieu.